The Düsseldorfer Toastmasters Committee is voted on each year. Being a committee member can be a lot of fun and can also help to develop valuable leadership skills. Christine is a self employed photographer with her own studio in Düsseldorf. She is specialized in business photograhy and executive portraits. When she joined Toastmasters in 2013, she was looking for a way to help her clients to have a more confident appearance in front of the camera and in their photos. As a photographer, she speaks publically about body language and presence as well as about the importance of having excellent photo material. Rimma has a degree in business economy and has been enthusiastic about Toastmasters since becoming a member in her home town of Kiew. She continued to use Toastmasters as a self development tool when she came to Germany. 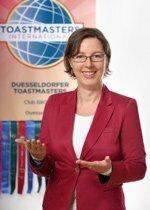 During her time at the University, she was a member of the Bochumer Toastmaster and later joined the Düsseldorfer Toastmasters. She has acquired the titles “Competent Leader” and “Competent Communicator” and nows attends to the needs of the club members. The presentation of club meeting, the entertaining and informative speeches, the international audiences and the possibility to speak in German and in English are what continue to keep her interested in attending the club meetings. Rimma works as a business analyst for a large energy cooperation. Malte is a self employed business consultant as well as an honorary president of the BDU “Bundesverband Deutscher Unternehmensberater”, the author of several books, a columnist and a commentator. Malte has had over 1000 public speaking engagements as a member of discussion panels, a moderator and as a key note speaker. He has also been on TV and on the radio. His key subjects are customer centricity as a key business element, leadership, marketing, sales, cooperate communication, change, future and creativity as well as innovation and health care. Malte joined Toastmasters in 2013 to optimize his “5-minute-speech-giving” and to experiment with different speaking techniques. He has acheived the highest level as a speaker ACG (Advanced Communicator Gold). Hans-Christian studied textile design and is a self employed communication designer as well as a software trainer. He has extensive experience with international textile brands. Today Christian advises e-commerce companies on their digital marketing and brand development. He joined Toastmasters in 2012 to improve his speaking skills. Since then Christian has taken part in almost every club evening and especially enjoys the English meetings. He not only values Toastmasters as a public speaking club, but also for its goal to help its members’ leadership skills. In his opinion, the best way for a networker to motivate people and to get across information is through unencumbered and authentic speaking. Christian give seminares and speaks on subjects such as web development, personal factors of success as well as interesting things from the internet. Mihaly, who studied physics, had come a long way before joining the Düsseldorfer Toastmasters. After finishing his studies in Budapest and Wien, he moved to Düsseldorf for love. As a deputy head of a calibrating labratory he would like to improve his presentaion and speaking skills as well as better his leadership skills. He heard about Toastmasters from a friend and has been an enthusiastic member ever since. He regularly visits both the German and the English club meetings and has gained the level of a competent communicator. Michael has been interested in the subjects communication, influence and personal development for his whole life. In 2008 he started the online magazine “30Tausend” in which he works together with many experts in these fields to develop new ideas and to further his network. His main job is as a personnel consultant to mid-sized companies for their executive and management level personnel needs. 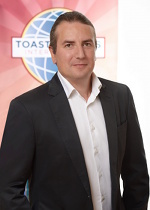 Michael joined Toastmasters in 2014 in order to enhance his communication and leadership skills. He likes being in contact with so many interesting personalities and the conversations that he has with them. Outside of Toastmasters and his work, Michael loves to play golf and always works on new ideas and innovations. Ferdinand is a personnel consultant, has a degree in economics and has been an enthuastic Toastmasters member since 2014. After toying with self employment, Ferdinand decided to make a change and started working for a company in the health care industry. His main focus in this career was sales and marketing. 10 years ago he decided to go into the field of personnel consultanting where he could use his network, leadership and market skills in order to serve his clients. Since then he has remained exicted about scouting out talented management candidates as well as other experienced professionals. Communicating on various levels and through different channels is part of his daily life. He likes to use his speaking skills to better reach, inspire and convince the minds of his audiences. 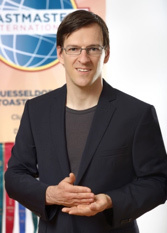 Ferdinand has fun at the Düsseldorfer Toastmasters: entertaining evenings with interesting people from all over the world, speeches about fascinating and creative subjects and watching the speakers become more and more professional is always rewarding for him. It shouldn’t come as a surprise that the treasurer of the Düsseldorfer Toastmasters also works in a bank. He uses his newly aquired speaking skills to impress his co-workers and clients. Knowing how to properly present a presentation for difficult projects is a very helpful skill. Boris is also able to use his speaking and leadership skills in his family of four children. 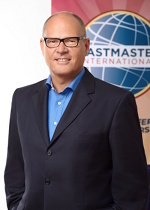 The combination of professional training scenarios along with the familiar atmosphere at the meetings is what convinced Boris that Toastmasters is right for him. Jakub is from the Czech Republic and has a degree in computer science and a master in international relations. He works as a software tester and is developing his own online business trading chocolate and rum. He started his Toastmasters career in 2012 in Prag before joining the Düsseldorfer Toastmasters club in 2013. He is interested in bettering his speaking and leadership skills, but also enjoys the networking aspect of the DTM club. Jakub speaks about the subjects of software testing, quality control, applied mathmatics and internatinal relations. 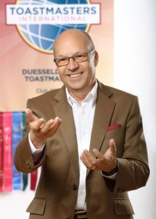 Dirk is a genuine Rhinelander, an IT expert and a founder member of the Düsseldorf Toastmasters. He regularly participates as a speaker in Toastmaster events both at home and abroad, and he holds the highest rank of “Distinguished Toastmaster” with Toastmasters International. Apart from being involved in two clubs, Dirk, as a coach and “doctor of speech” supports people who want to improve their rhetoric skills. In 2005 he initiated the foundation of our club and has remained a devoted member ever since, taking a lot of different roles. In 2016 we therefore made him our honorary member. In doing so we wanted to express our appreciation of his continuous support. Thank you very much!